Frederic Eliot makes the rectangle of pork paté just a little more perfect each time. And the stakes are high – the smallest crack in the dough or the smallest variation in temperature can sink the dish. 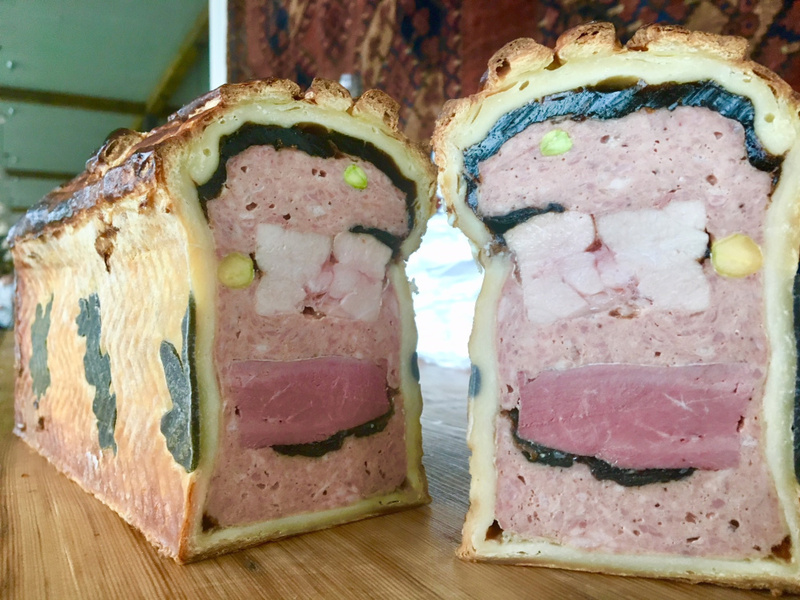 When a customer at Scales tastes a slice of the restaurant’s paté en croute, it’s like seeing the Wizard of Oz in all his glory, without peeking at the mortal chef behind the curtain. 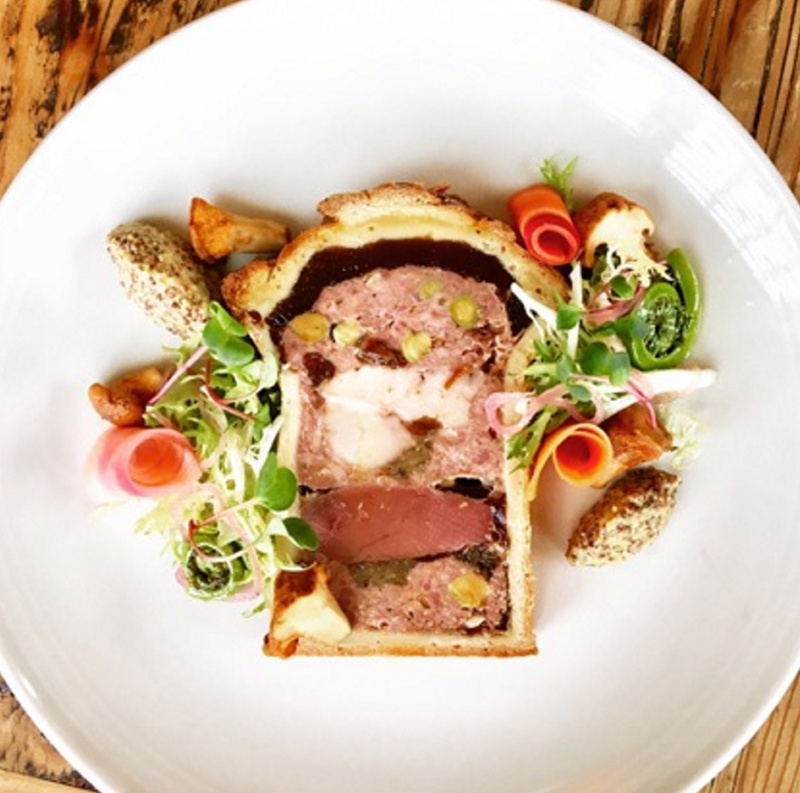 The diner has no idea that it has taken the head chef, Frederic Eliot, three days to make the 14-by-3-inch rectangle of pork paté layered with duck breast and sweetbreads, wrapped in a special dough, and filled with gelée, a savory gelatin. 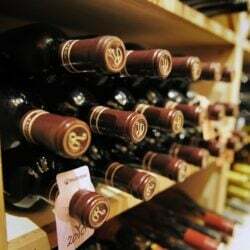 Or that he has been making them again and again in the last 15 months under the occasional guidance of chefs from New York, France and England, learning a little bit more – and perfecting it more – with each one he finishes. The diner never glimpses the whole, remaining ignorant of the artistry and labor that goes into completing a paté en croute. The slightest crack in the dough can ruin it. The layers of farce (the pork mixture), duck and sweetbreads must be placed evenly, and the farce painstakingly smoothed into all the little crevices so the slices won’t be marred by air pockets. 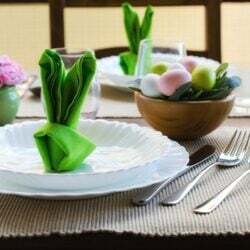 Small variations in temperature can leave the dough overcooked, the pork undercooked, or the gelée a mess. Before it is cut into beautiful slices, Eliot’s paté en croute is carefully decorated with dough cut into the shapes of leaves and grapevines. The delicacy is both a favorite memory from the chef’s childhood in Paris – in France, it’s a treasured holiday custom – and a labor of love. 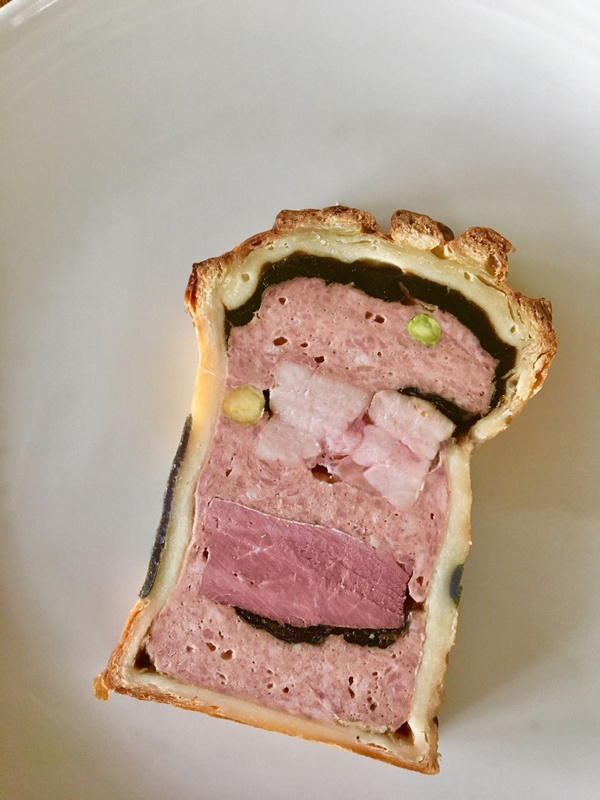 If it all goes well, the finished paté en croute is eaten first with the eyes. It’s like a Christmas gift for adults. What will be inside this beautiful package? Learning how to make paté en croute has been on Eliot’s bucket list for years, but it was only when he came to Scales that he had an oven that could do it justice, one that was able to bake at very precise temperatures. Now he makes one every other week, displaying the increasingly stunning results on Facebook and Instagram. It often sells out in one night. It’s the second day in the process, and Eliot has all the ingredients for this week’s paté en croute lined up for assembly. On the counter in the restaurant’s open kitchen sits a traditional, rectangular paté en croute mold; a tray of rolled-out dough, including the pastry cutouts; and two large pastry bags filled with farce – made the day before with ground pork shoulder, cognac, pistachios, fatback, pork liver and paté spice, which is made up of warm spices similar to those in gingerbread. 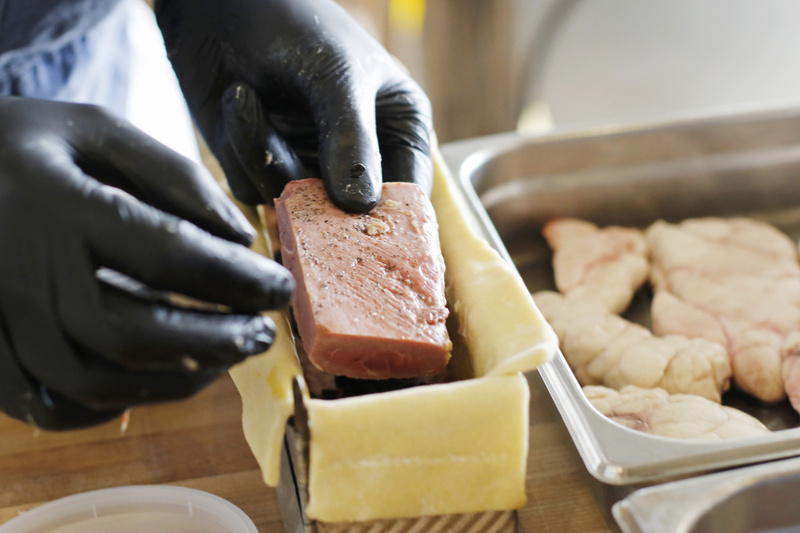 Next to the paté is a pan containing four duck breasts that were seared in duck fat and quick-cured the day before, a pan of poached veal sweetbreads (the thymus gland of the young cow), a container of egg wash, and two containers of gelée made from a clarified veal demiglace. Scissors, a spatula, an offset spatula and a pastry brush are laid out, as well. 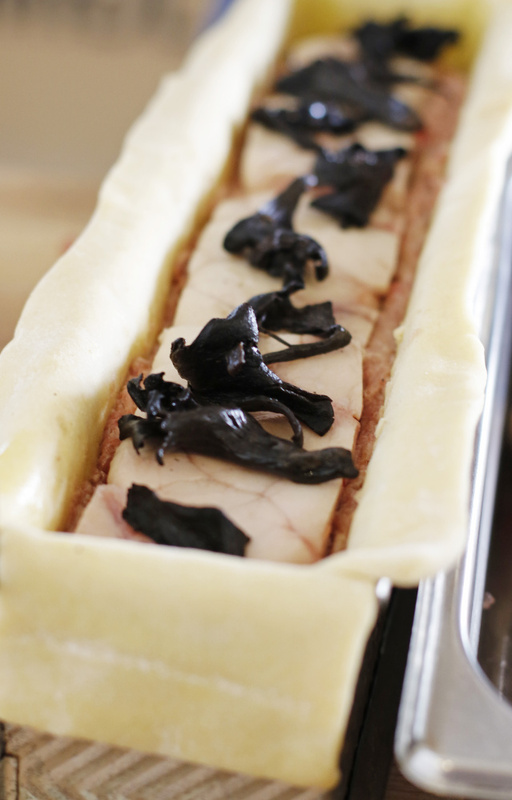 Frederic Eliot, the chef at Scales, applies an egg wash atop his oven-ready pate en croute. Today Eliot is taking another baby step forward toward mastery. He has dyed some dough with squid ink and used cookie cutters to make black leaves. 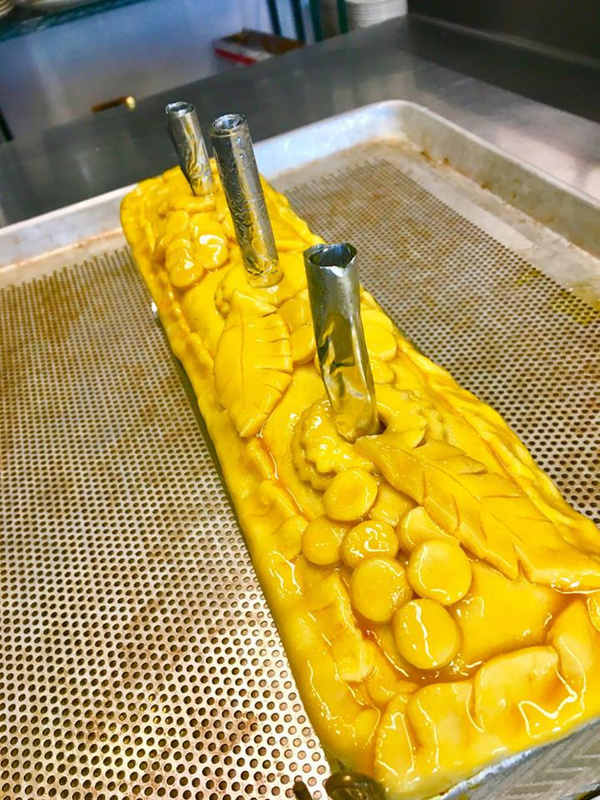 The decorations will be placed on the sides of the paté en croute mold so they will embed in the dough when he presses it in. The best chefs make elaborate designs, Eliot said; he just wants to get good enough that he can do a few snowflakes or Christmas trees, or maybe holly for the holidays. His dough lies somewhere between pie dough and puff pastry, but it contains eggs, milk powder, and a little vinegar, which gives it elasticity. Working with it and baking it can be tricky. “You want to make sure that the dough is cooked without overcooking the farce,” Eliot said. Why did it take so long for Eliot, a Frenchman, to start making such a quintessential French dish? It takes a lot of time and the right equipment, for one, but Eliot adds that before he could make a decent paté en croute, he needed a strong foundation in charcuterie. He says he didn’t start learning those Old World techniques until he worked in New York. 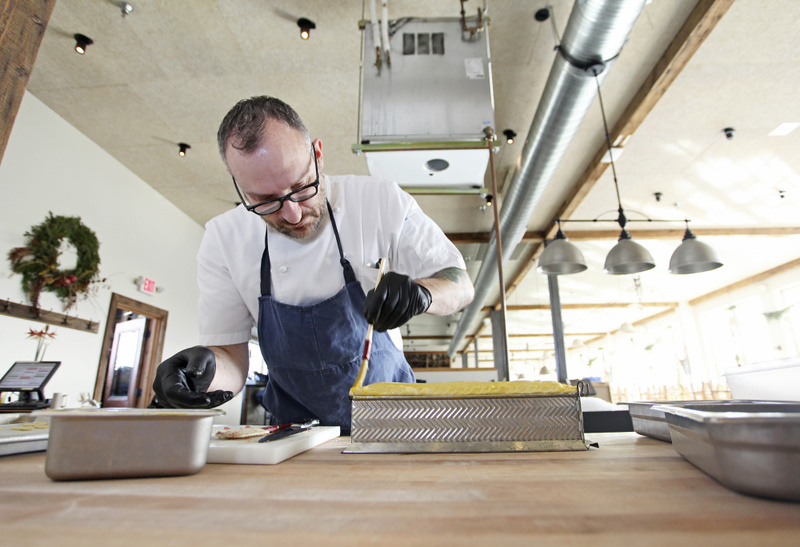 Eliot places duck breast into the pan while building paté en croute at Scales. 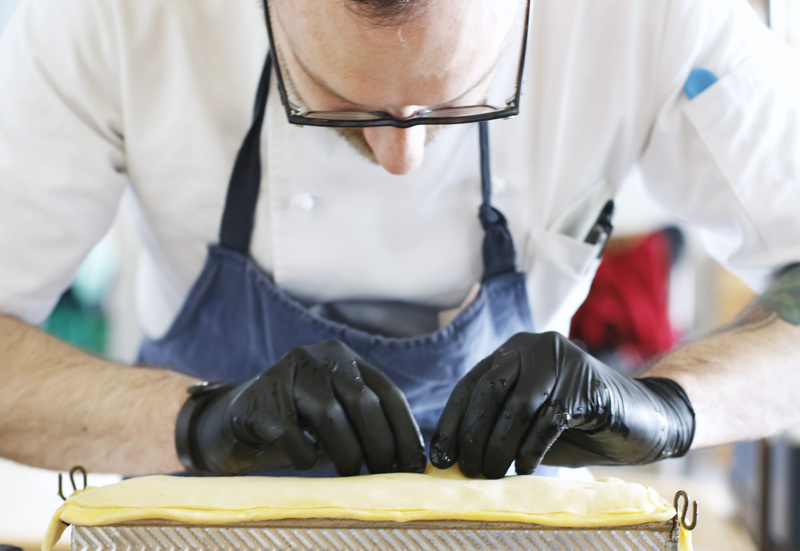 Wearing black gloves and a blue apron, Eliot gently pats the side and bottom dough into the mold, working hard to get it the same thickness all the way around. The dough must be very cold so it doesn’t rip. A little hangs over the edge of the mold. A brush of egg wash, and the mold is ready for the next steps. First comes a flat layer of cold farce, laid down nice and tight so there are not too many air pockets. Both pastry bags burst, and Eliot pauses to jerry-rig them. Next comes a layer of black trumpet mushrooms, followed by sliced duck breast, then another layer of farce. Eliot then trims and slices the sweetbreads and layers them in, and adds more mushrooms. He ends with a final layer of farce. 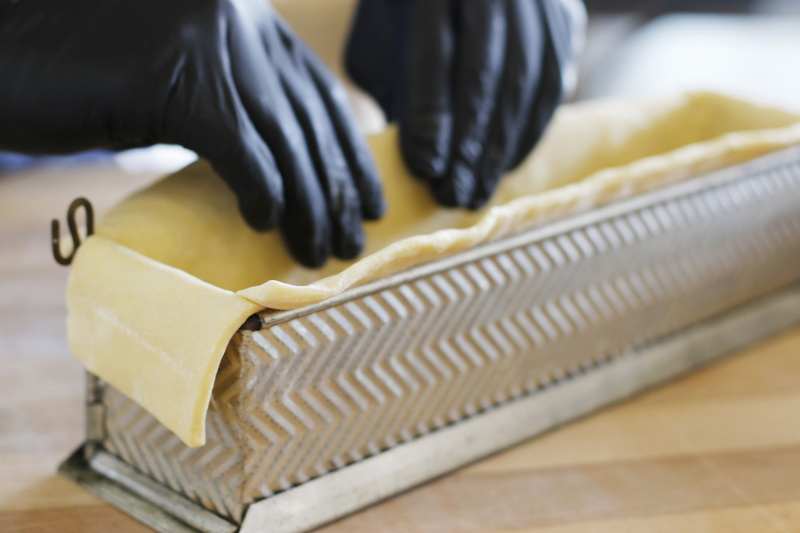 The “lid” of dough is placed across the top, then Eliot starts folding and crimping the edges. The leaf and grape decorations are the final touch. In addition to those designs, Eliot lays down three dough circles that look like little wreaths, evenly spaced along the top of the mold. These will become vents with foil tubes sticking out of them that, Eliot jokes, make the paté en croute look like the Titanic. But without these vents, the project would indeed be a disaster in the making. As the farce cooks, it swells and pushes up the dough, which can bake and set that way, leaving a gap between the meat and the dough that can cause the dough to collapse. 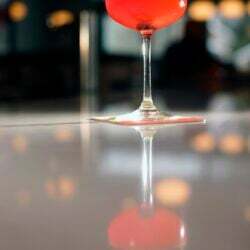 It can also crack the dough, which means when the gelée goes in, it pours out everywhere, along with the meat’s juices. 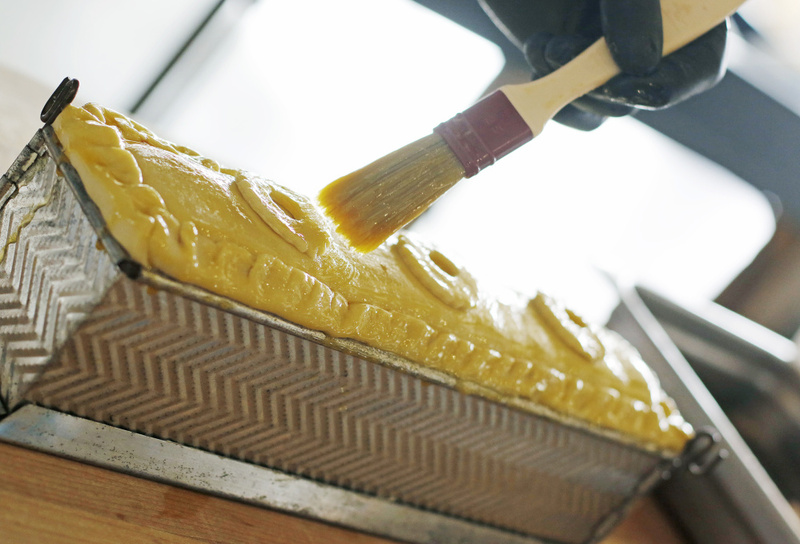 The gelée is added after the paté en croute has come out of the oven and cools to a temperature of 90 degrees. Eliot’s finished paté en croute shows the dish’s prized delineated layers and no gap between filling and dough. Eliot’s next big challenge is to make a paté en croute with foie gras. He has mixed foie gras into the paté before, but he has never attempted pure foie gras, which is added in frozen blocks so it won’t melt away. For now, he’s happy introducing Portlanders to his creations, one slice at a time. When he first started making them, he said, customers “weren’t sure about it,” but no longer. Often they now sell out the first night they’re put on the menu. Each mold produces about 12 slices, priced at $14 each, and served with whole-grain mustard, pickled carrots, red onions, chanterelles, and a frisée salad. Eliot eats a slice of paté en croute every time he makes it – “a little pleasure that I have.” He checks to make sure the flavors are well balanced, and always – always – thinks about ways it can be improved. That’s part of the fun of making it, he says.